I attended this concert, as well as the "Topographic Oceans" show earlier that same year. The stage set was an upgraded version of the "Togopgraphic Oceans" stage, with the beetle over the drums, ansd ribs over the keys. They still had the glitter ball that signaled CTTE. They added two "butterfly"-shaped projection screens at the sides of the stage on which they projected ocean waves during "To Be Over", and I recall some other scenes played during GoD too. This time they entered the stage set from a "shell" at the back. It was "bomb" in the veracular of that time! The next year they would play at Rynearson Stadium in Ypsilanti with the "barnacle" set. 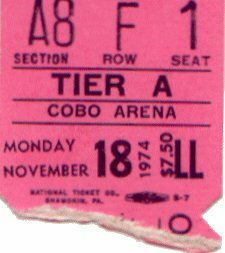 In 1976, they returned to Cobo with the "crab nebula" set, for 2 nights. In my almost 40 years of concert attendance, I think that Yes' 1976 stage has never been topped. I so wish there was film footage available to show everyone "what happened"! Please excuse yet another indulgence by a Moraz-edition Yes obsessionist who hadn't even heard of Yes before 1977, much less saw them during Moraz' tenure. A reviewer below speculates on what stage set was used when during this most creatively and technically brilliant of Yes' incarnations. Having for many years hungrily devoured every last photo and description from every Relayer-epoch show I could find, I'm prepared to bet that "barnacles" were strictly a 1975 tour phenom. In late '74 they seem to have had just a slightly modified Topographic tour stage set. If by "crab nebula" we also mean "vertebrae", "3-headed monster", etc. there can be no doubt we are speaking of 1976 [the tour I most agonize over having missed]. "Crab nebula" otherwise must refer to something in 1975's configuration, as the reviewer suggests - perhaps either Moraz' organic looking "organ pipes" or Alan's enclosure. In any case, barnacles were definitely '75 vintage and three vertebral columns with metamorphing heads assuredly '76. I'm certain the barnacles were not present either in '74 or '76. I've noticed that all the photos taken of this tour are of the barnacle stage set. I know I was at this cobo hall show (having moved to Vancouver in may of '75) and distinctly remember the three headed crab nebula stage set. I saw the barnacle stage in Vancouver in the summer of '75 during the second leg of the tour and never went to the solos show. Was this just a preview of the "crab" or were both stages being used??? Gryphon opened for the band in Detroit and were phenomenal. After hearing their set I immediately bought two of their albums, one of which was forgettable. However, I still listen to "Red Queen to Gryphon Three" from time to time. Note that percussionist David Oberle of Gryphon gives an excellent performance on "The Nature of the Sea" from "Beginnings." Guitarist Graeme Taylor also appears on that song.